The brilliant turquoise waters of Chalk Sound National Park on Providenciales. The environment of the Turks and Caicos is spectacular, from the incredible beaches to the verdant and pristine wetlands. The best way to experience our beautiful by nature country is by eco-tour, as you’ll the see all of the interesting wildlife and inspiring landscapes up close and personal. 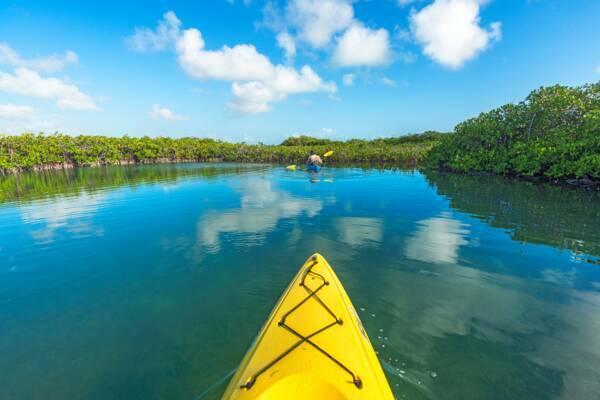 Exploring Turks and Caicos mangrove estuaries on a kayak eco-tour. 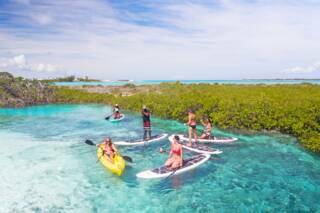 There’s a wonderful selection of eco-tours and activities in the Turks and Caicos, from simple wetland paddle board adventures, to extended trips to remote and beautiful nature reserves. A great aspect to outdoor excursions at Providenciales is the variance in possible activities and sights. There’s a perfect way for everyone to experience the Beautiful by Nature Turks and Caicos, be it on foot, by kayak and paddle board, on a guided tour, or on a custom boat charter. When eco-tours are mentioned in the Turks and Caicos, typically the first things that springs to mind are kayak or stand up paddle board trips in our marine mangrove estuaries and wetlands. The Caicos Islands archipelago in the Turks and Caicos supports an awe-inspiring array of tidal red mangrove channels. Primarily, this network of wetlands is found on the southern coasts of North Caicos, Middle Caicos, and East Caicos, and collectively there are hundreds of miles of estuaries to explore. The Turks and Caicos wetlands are perfect for both kayaking and paddle boarding. Generally, paddlers will find that they prefer one water craft over the other. A good sit-in touring kayak offers unparalleled tracking, speed, and efficiency, yet a paddle board gives a much better view into the water and over the wetlands due to the user’s higher point of view, and is faster when heading downwind. Big Blue Collective, located on the scenic Leeward Going Through Channel near the Princess Alexandra Nature Reserve, maintains the largest fleet and variety of kayaks and paddle boards in the country. The mangrove channels shelters a fascinating range of wildlife. Above the green canopy of vegetation, birdlife sightings can include wading birds such as flamingos, great egrets, reddish egrets, blue herons, tri-coloured herons, yellow crowned night herons, and green herons. Raptor sightings are often a little more limited, yet may be ospreys, peregrine falcons, red kites, American kestrels, and Antillean nighthawks. Some of the smaller or more unusual species include the eye-catching mangrove cuckoo, majestic frigatebird, Bahamas woodstar hummingbird, the endangered West Indian whistling duck, and kingfisher. Under the water’s surface, there’s conch, turtles, stingrays, small lemon sharks and nurse sharks, fish of many different types, and starfish. 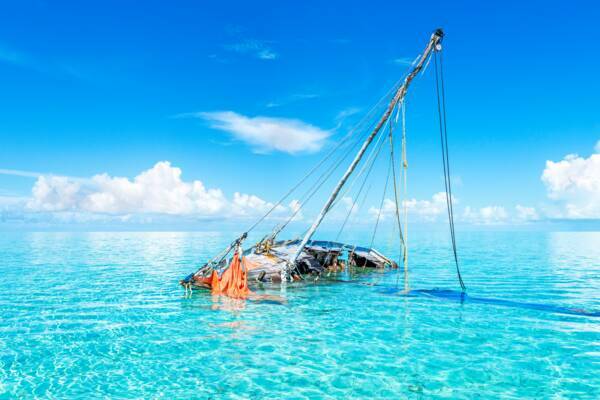 Sailboat wreck in the Caicos Banks. 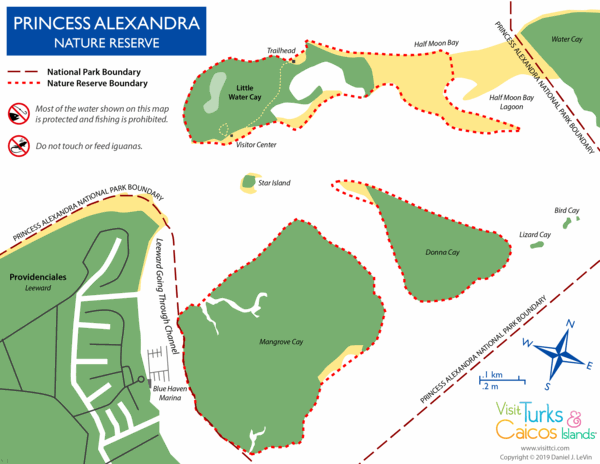 One of the best and easily-accessible paddling locations in the Tours and Caicos are the wetland and uninhabited islands of the Princess Alexandra Nature Reserve near Leeward on Providenciales. This system of cays and shallows hides beautiful beaches and interesting wildlife above and below the water. Inside the protected area are the islands of Mangrove Cay, Donna Cay, Little Water Cay, and part of the incredible Half Moon Bay lagoon. The Princess Alexandra Nature Reserve is great for eco paddling trips, and tours can be catered well according to group size and experience. The channels of Mangrove Cay are only a few minutes from Providenciales, and more strenuous trips can be made out the iguana sanctuary of Little Water Cay. Half Moon Bay offers both a sheltered and shallow lagoon as wells as an amazing beach. 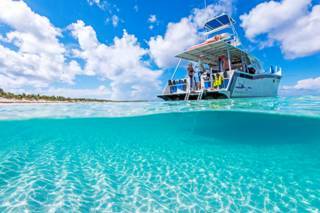 The destination is a very popular stop on boat charters and excursions from Providenciales. Little Water Cay, Mangrove Cay, Donna Cay, and Half Moon Bay all support populations of the critically endangered Turks and Caicos Islands Rock Iguana, a unique and friendly large lizard that’s only found in our islands. 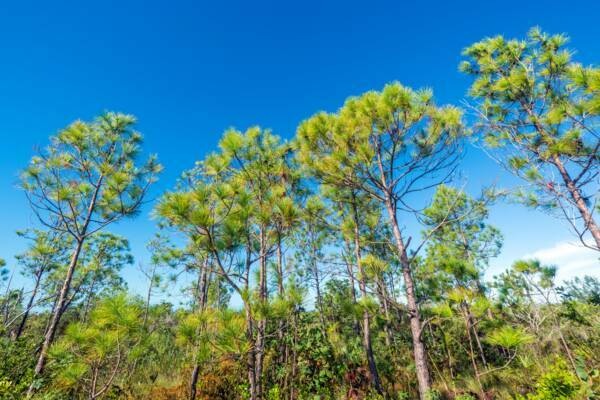 The Turks and Caicos supports an amazing array of terrains, including a unique Caicos Pine forest. The verdant Garden Islands of North Caicos and Middle Caicos are the undeniable centre of eco hiking and cycling in the Turks and Caicos. There are countless secluded coastlines and miles of quite paved roads to discover. The best-known hiking route in the Turks and Caicos is the scenic Crossing Place Trail on Middle Caicos, a historical trail that was once the traditional link between North Caicos and Middle Caicos. This path started at the village of Conch Bar, and lead west along the limestone bluffs and cliffs of Mudjin Harbour, Norbellis Cove, and Juniper Hole at the far north-western end of the island. Continuing from this point, the trail forded the shallow channel to Well Cay, then to Conch Cay, East Bay Cay, and finally across Bottle Creek Lagoon to North Caicos. Today, only the Middle Caicos portion of the Crossing Place Trail is typically visited. Iconic ceramic trail markers can be seen along much of this section of the route. Providenciales has extensive one scenic wetland cycling or running route, which is the extended drive out to West Harbour Bluff through the wetlands of the Frenchman’s Creek Nature Reserve. This remote region of Providenciales hides incredible coastal scenes, historical features spanning more than six centuries, a natural salt flat, and several secluded beaches. Although a little remote, the island of West Caicos combines a great selection of natural and historical sights, and is a perfect day trip destination. On the marine side, there are pristine beaches, exquisite snorkelling and scuba diving reefs, unbelievably blue ocean water, and ocean cliffs that are great for jumping off of. On land, there’s the fascinating Yankee Town historical site, and old small gauge donkey railroad causeway, the extensive Lake Catherine Nature Reserve, abundant birdlife, and underwater caves. Due to the distance from Providenciales, adventures to West Caicos are typically custom charters, and the day is usually planned around what the guests would prefer to do. Camping by boat at an uninhabited cay in the Turks and Caicos. It’s certainly not for everyone, yet a camping trip eco-adventure to the remote cays of the Turks and Caicos can be a very rewarding experience. There’s a wonderful array of beaches and islands to discover, many of which rarely see any visitors. East Caicos is a great spot for the adventurous whom are ready to brave mosquitoes and the intense sun. This uninhabited island features weather-beaten beaches, extensive mangrove wetlands, and caves. The East Bay Islands National Park near North Caicos and Middle Caicos is one such region. This incredible coastal area includes pristine wetlands, secluded beaches, and amazing potential for wildlife sightings. The national park is bordered by the extensive and shallow Bottle Creek Lagoon on one side, and a complex network of barrier reefs on the other, and consequently fosters a feeling of isolation while still being within easy access of North Caicos. Another great experiences is a guided sailing eco-tour. Chalk Sound National Park, the East Bay Islands National Park, Frenchman’s Creek Nature Reserve, and many other exquisite locations are perfect for the activity. Last reviewed by an editor on 1 March 2019.